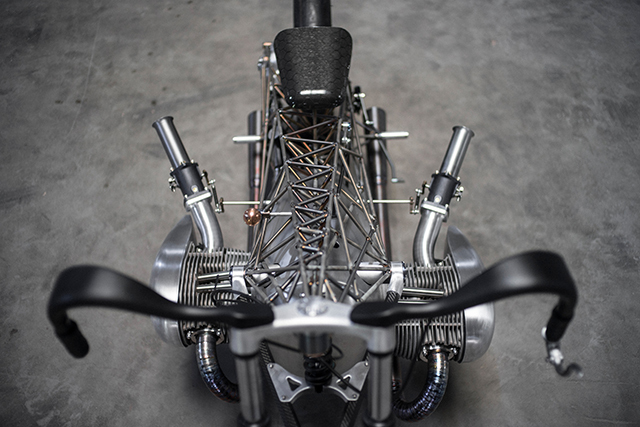 Revival Cycles’ latest build; “The Birdcage”, at first glance – looks to be the work of a madman. 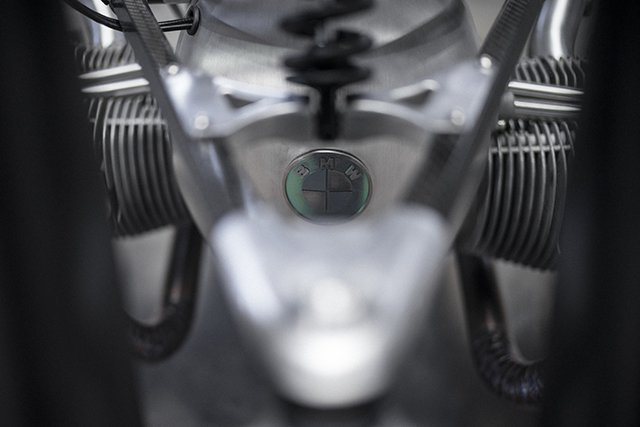 Showcasing BMW’s newest prototype boxer engine, the frame is entirely comprised of titanium (a first for the Revival team), made up of 150 separate pieces, taking a full 2 weeks, day and night, to finish welding. 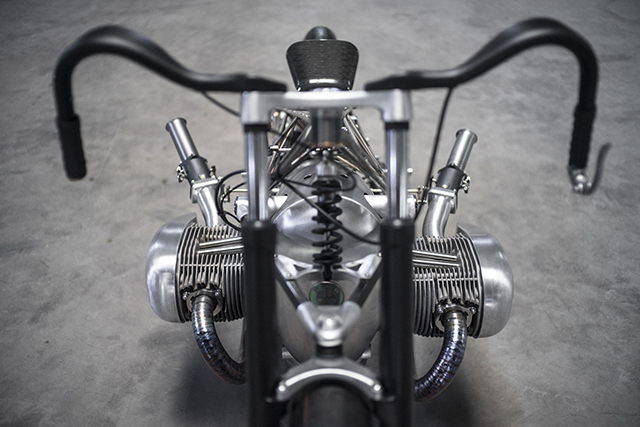 Almost every piece on the bike was fabricated in house, with great attention paid to design, function, and most importantly – weight. 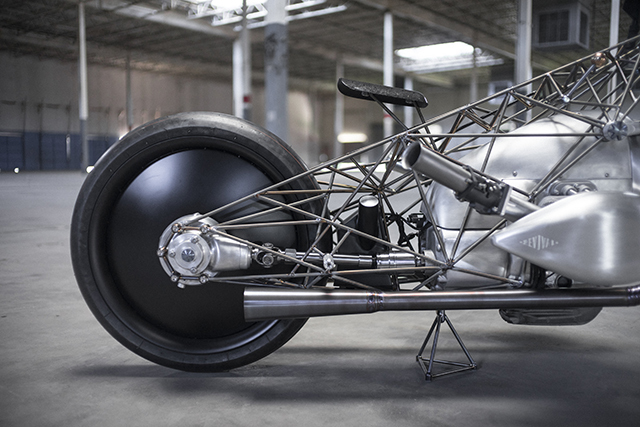 The asymmetrical frame of “The Birdcage” weighs in at a mere 25 pounds, and thanks to the beautiful marriage of hexagonal carbon fiber suspension and CNC-machine aluminum parts, it’s light as a feather. 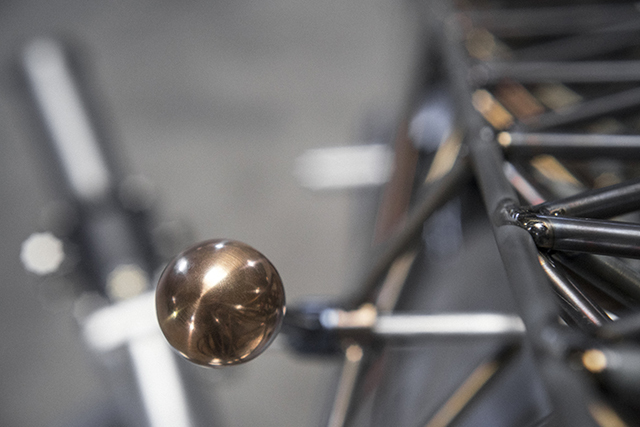 The only hint of color on the bike comes in the form of the frame and titanium exhaust system, which were anodized, adding a subtle peacock purple and green shade to the metal. 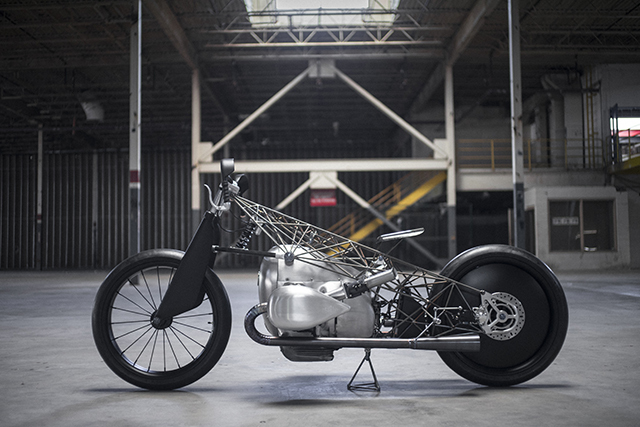 When asked what the driving force behind the build was, head designer Alan Stulberg stated; “I was driven by people saying it wouldn’t work”. 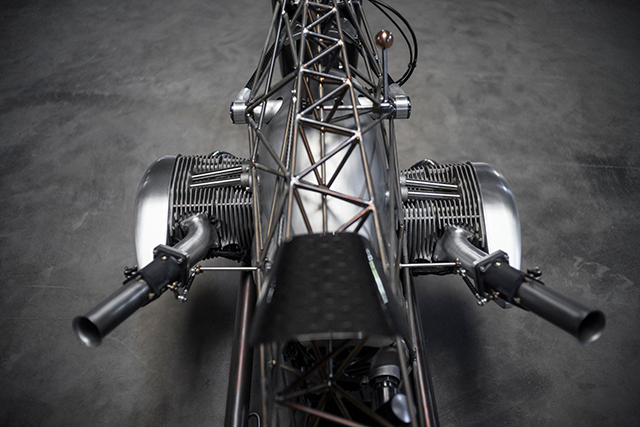 With visions of the original Maserati Tipo 61 “birdcage” frame dancing in his head and a few fingers of scotch in his belly, the concept was put to paper and the team got to work. 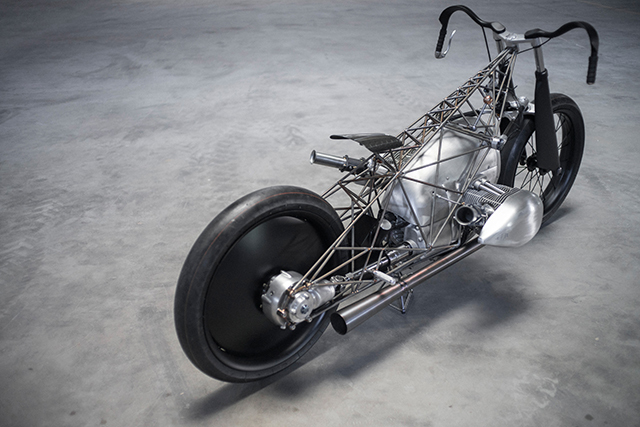 The bike was initially mocked up using welding wire to get a feel for the geometry, and due to the strength and lightness of titanium, it was chosen for the frame. 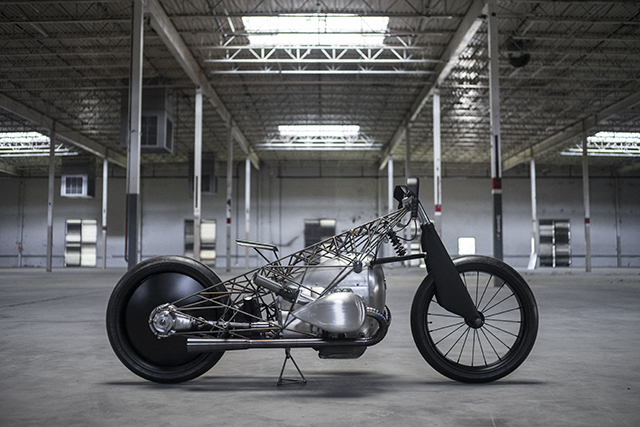 The details don’t stop at the physique – the Revival team fabricated everything – from the hand shifter to the titanium axle fasteners. 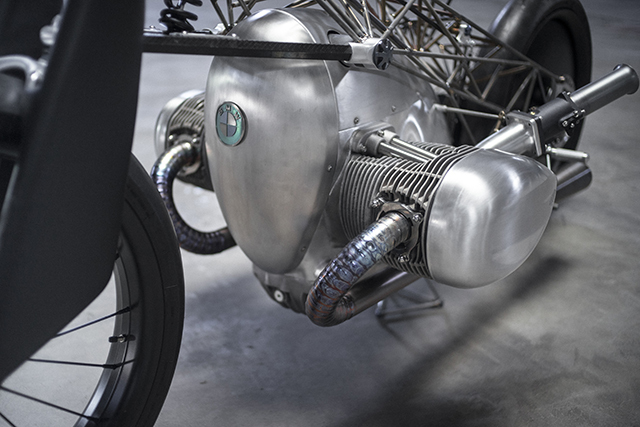 The aero-shaped handlebars, aluminium wheel cover and rear wheel (including custom brake caliper, brake carrier, hub and hub spacer) were all made in house, and serve as a double nod to the Hennes’ 1928 BMW Landspeeder and Revivals 2016’s homage to it. Although head scratching moments were certainly not limited in the 5 month time build process, the tires presented a whole new challenge. 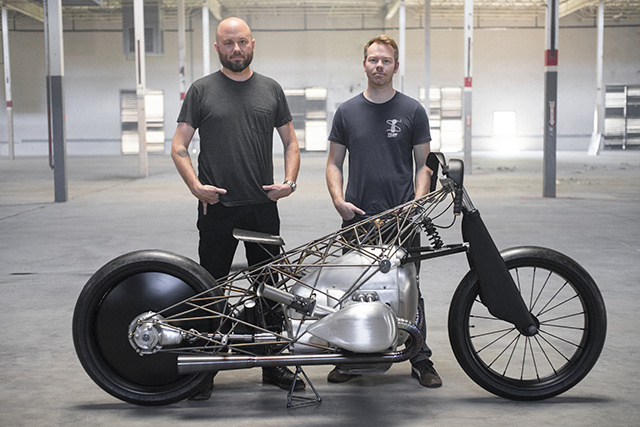 Finding 23’’ tires that fit the project intention was no easy feat, but after a well placed call to the good people over Dunlop, a set of prototype slicks were on the doorstep faster than you can say Amazon Prime. 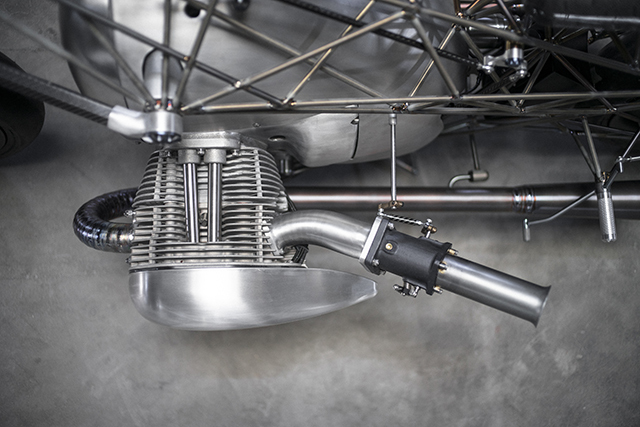 Fork lowers were carefully chosen from a BMW R 1150GS, and the front shock was originally an Ohlins mountain bike shock which the team sanded and powder coated black. 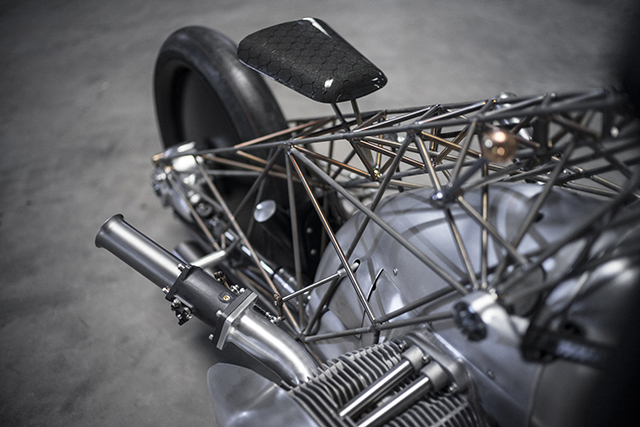 Swing your leg over the 1800cc (rumoured) boxer engine, which aluminum covers were fabricated for, and your tattered 501’s will be resting their pockets on a custom hexagonal carbon fibre seat. 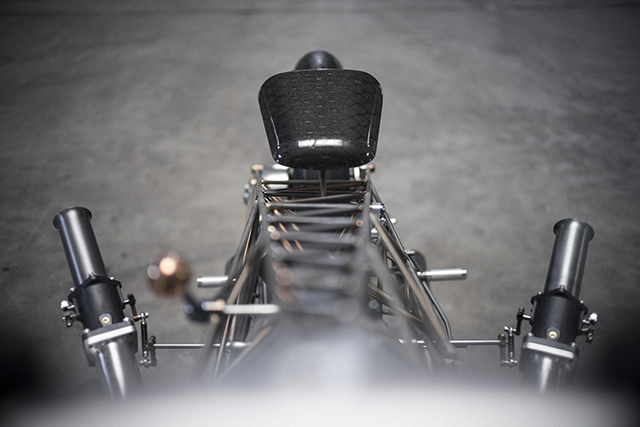 When we paid a visit to Revival HQ the morning of the Handbuilt show, the seat had just finished curing – the birdcage was literally down to the wire. What Alan and the Revival team have finessed here is the exact type of forward thinking that pushes the industry forward – while showing respect and tribute to the past. 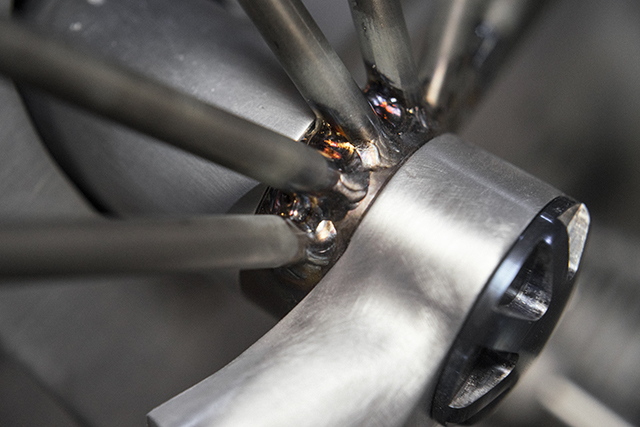 We can’t wait to see how BMW incorporates this into their production line moving forward. If this is what you call crazy – throw me in the loony bin.